The market continues to defy both the bulls and the bears. The former wants a pullback to buy, the latter feels we’re overbought. Can investors keep up the positivity during a holiday-shortened trading week next week? Remember, no trades for Monday, which is Martin Luther King Jr. Day. 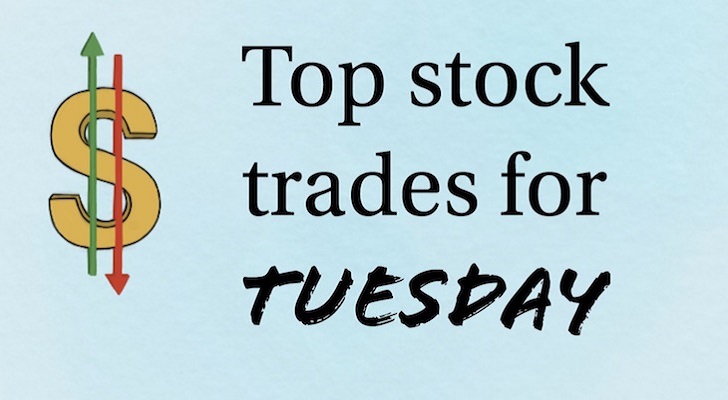 With that out of the way, let’s look at a few top stock trades for Tuesday. If I told you ahead of the report that Netflix (NASDAQ:NFLX) stock was up more than 50% over the past three weeks, but missed on revenue and subscription estimates, what would your prediction be for the stock price? While it’s closing near its lows on Friday, NFLX was threatening to go green at one point on Friday. Down just 4%, the damage is much more contained than many investors would have thought. That goes to show just how tough the prediction business is. In any regard, NFLX stock is on the cusp of filling that miniature gap from last week, near $335. That’s also where the 200-day moving average is. 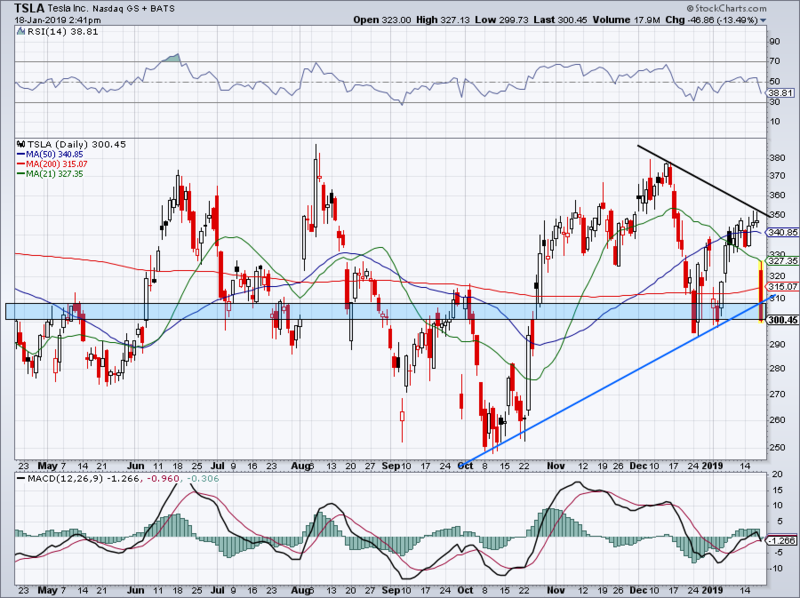 If those levels act as support — with a possible overshoot to $330 — then NFLX may very well continue higher. Below $330 and $300 is definitely possible. It was made public that Tesla (NASDAQ:TSLA) is reducing its workforce by 7% and likely generated worse bottom-line results in the fourth quarter than in the third quarter. That sent the stock down about 12% on the day to around $304. Tesla is grasping to the $300 to $310 support levels and a slight overshoot could land it in the $290s, which acted as support in December and earlier this month. If I was short this name, I’d likely look to cover at least some of the position after Friday’s decline. From the long side, it’s hard to take a bite into Tesla without seeing a rebound first. Ideally, it’d be nice to see TSLA stay over $310. For bulls, be careful if this loses its December lows. This one is plain and simple. 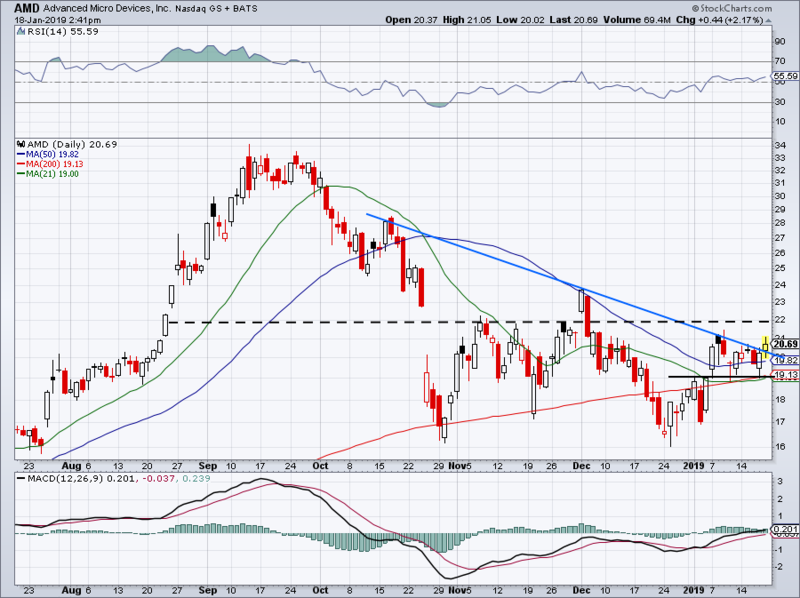 Over $19 and bulls can stay long Advanced Micro Devices (NASDAQ:AMD). I’d love to leave it at that, but let’s break it down a bit. AMD is breaking out over downtrend resistance (blue line), has all three major moving averages just below it as support and is clearly finding $19 as support. Below $19 and the setup fails. Conservative bulls can use the 50-day moving average as their stop-loss. However, AMD has room up to $22 and possibly higher depending on the overall market. I am long AT&T (NYSE:T) purely for its juicy 6.6% dividend yield. However, it always helps when the stock is trading well too. 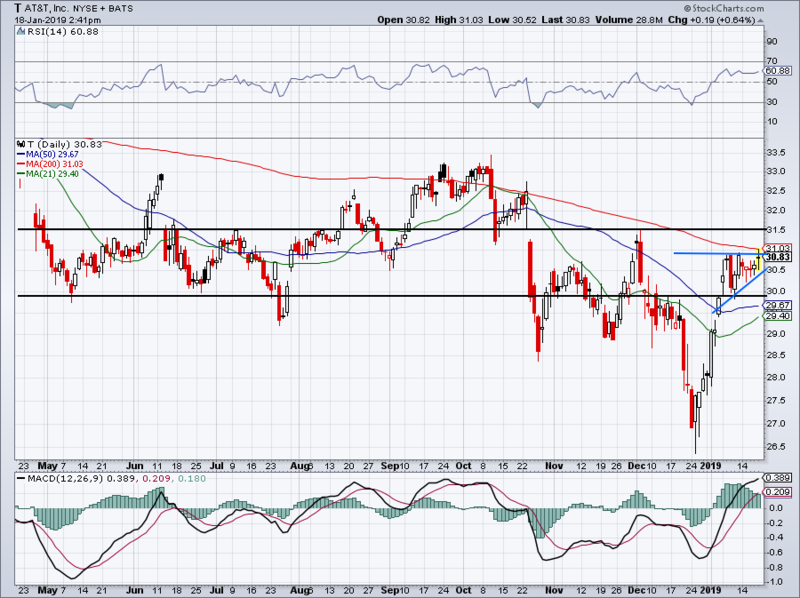 We have T consolidating higher here and if it can push through $31, we could see $31.50 in a hurry. Remember, this stock was at $33 just a few months ago. If we can pick up a mid-single-digit return plus collect a big dividend, that’s a win-win. 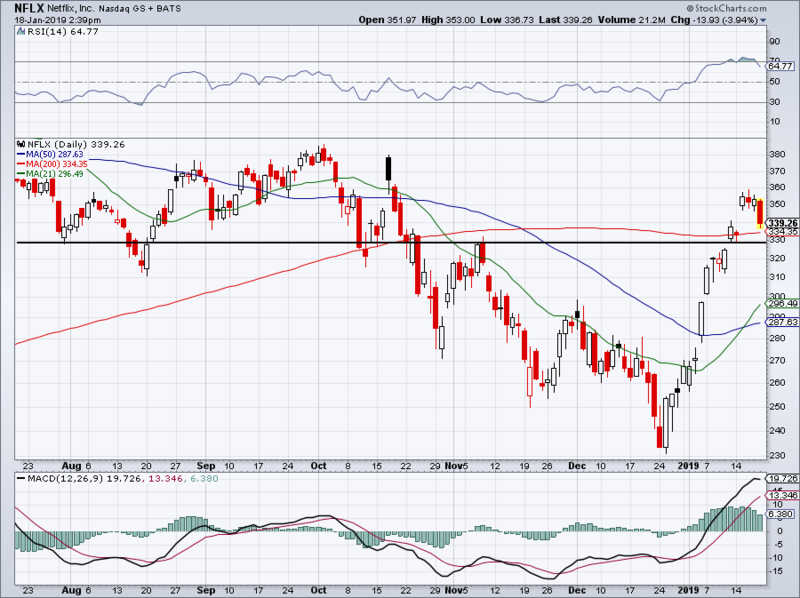 Above $30 and the 50-day moving average, and T stock still looks good. Everyone keeps talking about how fast the markets have rallied off the bottom and indeed, it has been a rapid rise. At some point that has to end, but pinpointing it has been tough. For the SPDR S&P 500 ETF (NYSEARCA:SPY), the ETF made a mockery of Fibonacci traders. Stopping right at the 50% retracement on Thursday, the S&P 500 surged over 1% on Friday. Just a bit higher from here, the 61.8% Fibonacci retracement rests at $269.45. If that weren’t notable enough, we have the 100-day moving average now crossing below the 200-day near $271. Maybe the SPY can surge ahead and overshoot these levels, but I would expect that it will at least cause investors to pause and/or take some profits. I wouldn’t be going heavily short right now, but I would be trimming some longs after this type of rally. According to the RSI (blue circle), we’re not wildly overbought. In fact, we’re not even technically overbought yet, with a reading of just 61.6 on chart. 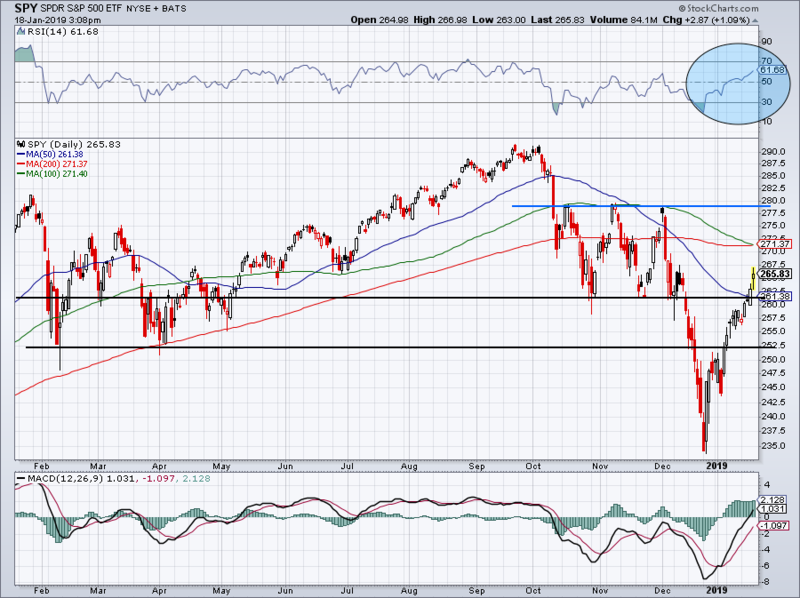 Should the SPY push through the 200-day, 100-day and 61.8% retracement, look for resistance between $278 and $280. That was a brick wall for the SPY in Q4. On the downside, look for support from the 50-day and $260 level. Article printed from InvestorPlace Media, https://investorplace.com/2019/01/5-top-stock-trades-for-tuesday-spy-nflx-tsla-amd-t/.